The Marcliffe at Pitfodels is a luxurious, relaxed and ultra-elegant five-star Scottish country hotel set in its own picturesque grounds on the outskirts of the historic city of Aberdeen in North-east Scotland. Since the officially opening in 1993 by Soviet Premier Mikhail Gorbachev, it has earned worldwide renown as Aberdeen’s only five-star hotel, and the ideal base for exploring all the many riches that Scotland has to offer. Although the Marcliffe offers a comprehensive range of superb facilities, which has deservedly earned it membership of the coveted Small Luxury Hotels of the World, it is essentially a family-friendly intimate hotel run by Owner Stewart Spence who is fiercely proud of its ambience of warmth, ease and charm. As one of the UK’s most distinguished hotels, the Marcliffe at has welcomed many high-profile guests. From the British Royal Family, there has been HRH Prince Charles and HRH Princess Anne; foreign dignitaries including the Sultan of Brunei; former British Prime Minister and world statesman Tony Blair; actor Charlton Heston and rock star Rod Stewart from the show business world, and legendary US golfer Tom Watson. It also caters specifically for the business and corporate world. 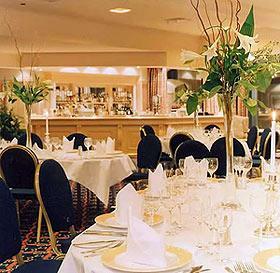 The hotel offers a choice of six private banqueting and conference rooms. These striking individually-decorated suites are ideal for cocktail parties, private luncheons and dinners, and receptions and board meetings for any number ranging from just two to 400. Many special events such as themed banquets, new product launches, press conferences and satellite conferencing are held in the various suites for our extensive private corporate client portfolio. And if you seek a romantic wedding, in the most romantic of countries, the Marcliffe at Pitfodels will provide an all-in package to cater for all your needs – even a kilted Scottish piper!